In general, marriage patterns have ebbed and flowed over time. Census data show fairly consistent patterns throughout the first half of the 20th century with a swing toward marriage in the 1950s and 1960s. Marriage rates then receded as the ranks of both the widowed and the never-married increased. In our sample, 56% of American adults over 18 are married or living as married, while 43% of adults are not married. 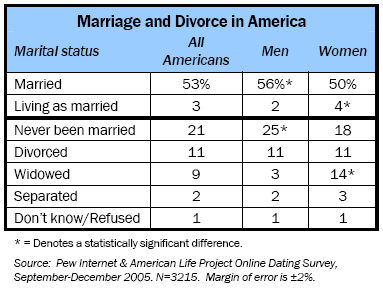 That 43% includes 11% who are divorced, 2% who are separated, 9% who are widowed, and 21% who have never been married. Looking at basic demographic variations, our survey showed that those with college degrees and higher levels of household income are significantly more likely to be married than those with high school diplomas and those living in households with more modest levels of income. African-Americans are more likely than whites and English-speaking Hispanics to have never been married. Most internet users who are married or in committed relationships met each other offline. 38% met at work or school. 34% met through family or friends. 13% met at a nightclub, bar, café, or other social gathering. 3% met through the internet. 1% met by chance, such as on the street. 1% met because they lived in the same neighborhood. 1% met on a blind date or through a dating service. The remainder cited a variety of other ways they met, such as growing up together. 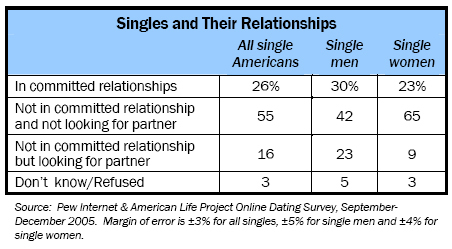 Only 16% of single Americans, or 7% of all adults, say they are hunting for a partner. While a sizable segment of the population is single, about a quarter of unmarried Americans (26%, or about 23 million adults) say they are in committed romantic relationships. Single men are more likely than single women to report being so situated. Yet among the uncommitted, relatively few say they are in the market for relationships. Among all singles, just 16% say they are currently looking for a romantic partner. That amounts to 7% of the adult population and 7% of internet users. Some 55% of singles report no active interest in seeking a romantic partner. This is especially true for women, for those who have been widowed or divorced, and for older singles. Yet even among the youngest adults, relationship-seeking is somewhat muted: 38% of singles ages 18-29 say they are not currently looking for a romantic partner, compared to 22% in that age cohort who are looking for partners. The rest say they are currently in committed relationships. 36% said they had been on no dates in the previous three months. 13% had been one date. 25% had been on 5 or more dates. This subpopulation of singles is too small in our survey sample to report highly reliable comparisons of men and women on this dating question. But it was generally the case that single men reported being less active than single women in going on dates. Americans who are single and looking for relationships are also more likely than those who are not looking to be employed full or part time. Two-thirds (67%) of single and looking Americans have a full or part-time job—while close to half (48%) of non-lookers are similarly employed. Single Americans in the market for a romantic partner are more likely to go online than non-lookers. Fully three-quarters (75%) of single adults who are looking for a romantic partner say they use the internet, compared to 56% of those who are not looking. And in more than a third of these cases, on-the-market singles are likely to use that internet connectivity to visit online dating websites; 37% of online singles who are looking for romantic partners use dating websites. Nevertheless, 61% of single and looking internet users do not use dating websites. A majority of relationship-seeking singles say it is difficult to meet people where they live. Sometimes geography and lack of proximity to desirable partners can complicate the search for a romantic partner. When singles who are actively looking for partners were asked about the dating scene where they live, a majority (55%) said it was difficult to meet people. Only 43% said it was easy, while 2% said they didn’t know. Moreover, when asked to describe the dating possibilities where they live, a plurality, 47%, said there were very few single people in their town they would be interested in dating. Another 41% said there were lots of single people in their town that seemed interesting, but 10% said they didn’t know much about the local singles scene. Part 3. Who Is Dating Online?